Maize starch was recovered from a plano-convex biface in Sub-operation 26a, Lot 1303, Feature Pit 2. The contents of Pit Feature 2 are located in the Archaic period aceramic level E (Rosenswig et al. 2014:311-312). The plano-convex biface was sampled for starch grains and yielded 5 definite maize (plus 2 possible maize), 1 squash, 2 manioc, and 1 chili (capsicum) (Rosenswig et al. 2014:Supplementary Table). Two carbonized wood samples from the E level were dated and both of these are in association with the plano-convex biface. The date reported here (UCIAMS-17909) is the younger of the two dates at 5835 +/- 20 uncal BP. 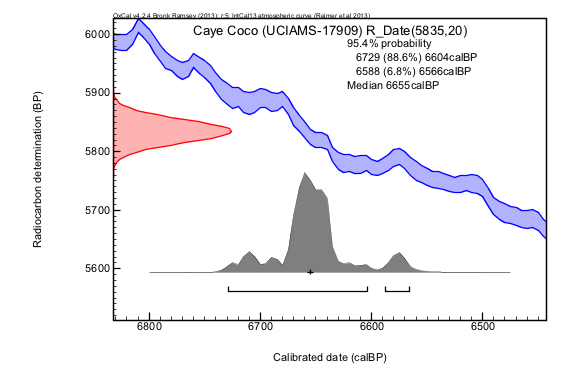 The older of the two dates (UCIAMS-17908) is 7415 +/- 20 uncal BP. Though the tool could be as old as the oldest of the two dates, with dating by association instead of direct dating of the sample, it is more likely the E level, and by association the stone tool, dates to the younger of the two 14C samples. The older 14C date could have resulted from mixing with old wood (Rosenswig et al. 2014:312), perhaps during the initial digging of the pit feature by the Archaic inhabitants of the site.